Let us start at the end. Your cat’s litter box should never smell. If you’re here looking for an answer to “how to get rid of litter box smell?” then something is clearly not set up properly with your litter box. Don’t worry, we’re here to help with a variety of solutions that will get your home smelling fresh and clean again. Assuming you clean your house and keep it fresh that is. We can only help you with the litter box issues – not everything else. Why does cat pee smell so bad? The smell of feline urine and feces has quite the reputation. Just ask any cat owner. Almost every “bad smell” list or poll includes a reference to cat pee. It really is that bad. The worst possible version is that of intact male cats. Known as “tom cats”, these males were never neutered. Their urine contains special chemicals and formulas intended for territorial marking. They’re supposed to announce the cat’s presence for miles away. Having them inside your home is almost unbearable. Even “regular” cat pee can smell pretty horrible. Not right away, but give it a few hours to days and the effect becomes pretty powerful. Here’s why. Urine contains a substance called urea. It’s a natural compound that the body secretes as part of normal metabolism. Urea is present in cat urine, human urine and pretty much the urine of any animal. Once it leaves the body, urea begins to break apart into various chemicals, including ammonia. Now, ammonia really does stink. Combine it with the various pheromones and other biological stuff in the old urine, and you get a rich cocktail of smells. Not a pleasant one. A gut-wrenching foul odor that you want to keep out of your home. That’s why dirty public bathrooms smell so bad too, by the way. Same smell. Old urine breaking up into a sickening ammonia-based cocktail of gases. Can cat urine make you sick? The smell of cat pee is not any worse than smelling dirty public toilets. Absolutely vile and disgusting but not dangerous per se. Some people wonder whether the fumes toxic to humans in any way? After all, this is ammonia in gas form. Surely breathing too much of it is dangerous? Water can be toxic. Oxygen can be highly toxic too. Clearly you can’t live without water or oxygen, right? Because it’s all a question of the amount and the way it’s absorbed into the body. With cat pee, unless you live in a home with 50 cats and puddles of cat pee everywhere, you’re probably not at any risk. How to tell where cat urine smell comes from? Is that actually litter box smell? Does the smell come from the litter box itself or from another area in your home? Sniff around to find out. Try to assess where the odor is stronger. Does it actually smell worse the closer you are to the litter box? The smell of cat pee and poo can be coming from the litter box or they could be coming from other places where your cat “went” outside the box. Some cats avoid the litter box and eliminate elsewhere. No matter where your cat goes, if it’s no in the litter box than you have a litter box avoidance problem on your hand. There are many possible reasons for litter box avoidance and we won’t be able to discuss them in this guide. We’re here to discuss reducing litter box smell, as in the smell emanating from an actual litter box. All we’re asking is that you take a few minutes to make absolutely sure this is where the odor is coming from. If it’s coming from your bed or from behind the sofa, adjusting the litter box may not be the first – or only – measure to take. If you checked and the smell is coming from somewhere else, the first thing you should do is call your vet and set up an appointment. Litter box problems are often triggered by physical illness, usually a urinary tract infection (UTI). Next, read this thorough guide about litter box problems and follow through on all the links. Not sure where the smell is coming from? If you suspect the smell isn’t coming from the litter box but can’t determine the exact source, it’s time to play detective. If you have a very good friend who can come over, enlist his or her help. Two noses are better than one! What a UV black light does is reflect light off biological material. Just switch off the lights and turn on the black light and all stains of biological origin will magically reveal themselves. Including cat pee stains! Again, if the smell isn’t coming from the litter box then you’re dealing with cat pee/poo stench but not with actual litter box smell. Cats should eliminate in the box, and if yours doesn’t – you have a litter box avoidance problem on your hand. Again, allow us to refer you to the litter box problems guide here. And good luck! You’re going to need it! Why would a litter box even smell? So, you know for sure that the litter box is indeed the source of that foul odor. What’s next? Cat litter can only hold so much urine and feces. With clumping litter, the urine is trapped within clumps of granules, providing better odor control. Up to a point that is. If you fail to scoop the box for several days, the smell is likely to become more noticeable. With non-clumping litter, it’s even more complicated. You may be scooping feces out, but the urine stays in the litter. Most non-clumping varieties of litter contain substances that absorb and contain the urine within them. In crystal type litters, these absorbent granules often have a different color than the others. As they soak up the pee, they change color, providing you with a good indication that they’re working. Once the absorbing materials have reached their ability to take in urine, it begins to wet other granules. At that point – or just before – it’s time for you to switch to a new type of litter. In a perfect world, cat poo and pee should never touch any part of the litter box. The cat would dig in a little (but not too deep as to reach the bottom), gently do his business in the hole and then cover it up. What he leaves behind will be totally and entirely surrounded by super absorbent granules of extra strong litter, preventing any contact between the urine and feces and the outside air. Alas, the world isn’t perfect. In reality, many cats manage to get the bottom or sides of the box dirty. And once urine drops – or more than just urine drops – hit the box and stay there, they will become very smelly. 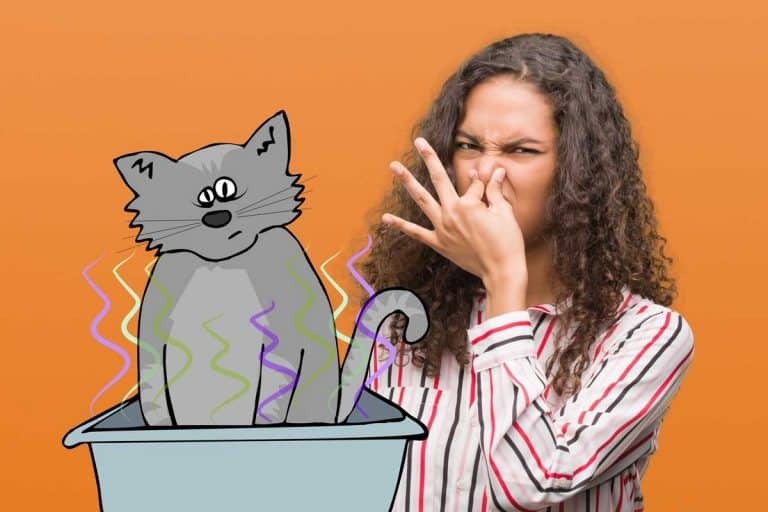 So far we’ve set the outline of our discussion – litter box smell and not just any cat pee smell – and explained why the litter box might be a source of foul odors. Now, let’s talk about fixing the situation. 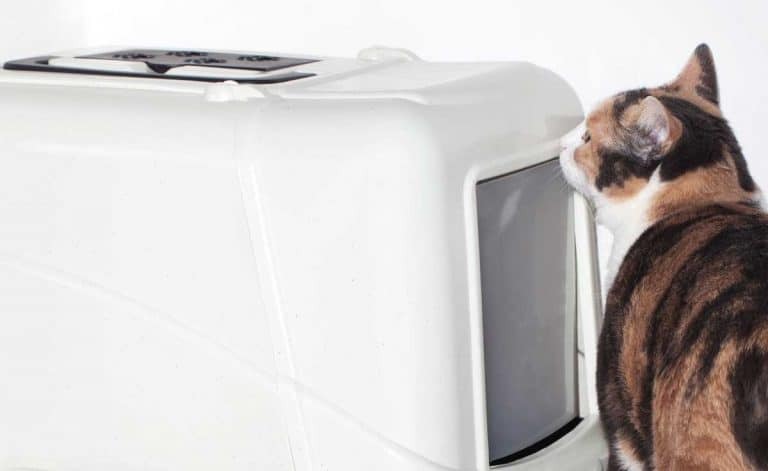 We’re going to give you a slew of solutions to reduce litter box smell. Read carefully and see which ones are a good match for your litter box routine. 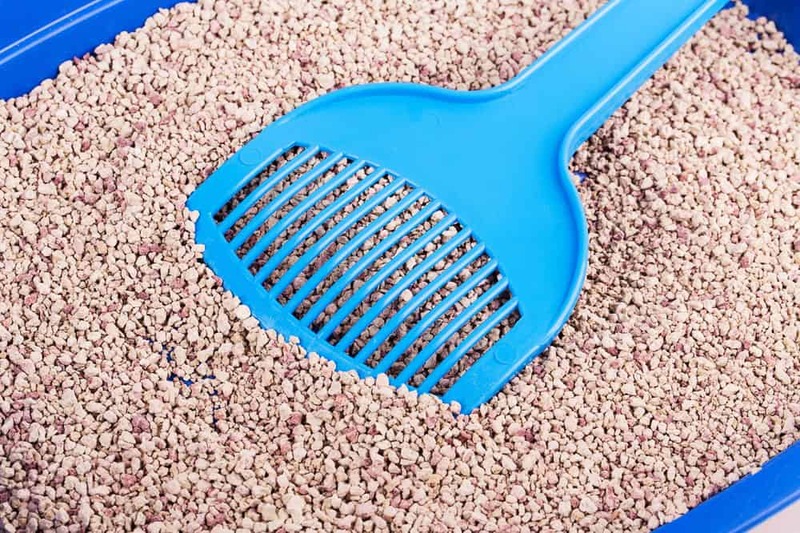 We promise you that one – or more – of these could drastically improve your litter pan odor troubles. If you apply all of them – there is no reason in the world for you to suffer from any litter box smell. Let’s talk about elaborate on each of the above. We’ve discussed the question of how often to scoop in the guide about how often to clean a litter box. 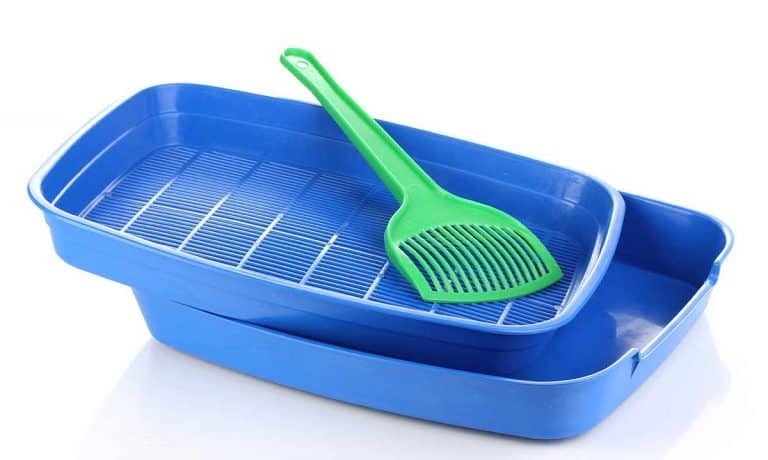 Unless you happen to own a self-cleaning litter box, you should manually scoop the litter box at least once a day. Twice a day is better, especially if you have several cats that use the same box. Make sure to scoop very thoroughly. Don’t leave any grain of litter unturned. Scoop carefully, taking care not to break clumps apart. Use your scoop to go deep and gently lift the clumps whole. And if you’re dealing with litter box smell consider scooping even more often. Some people scoop the box after each use just because their cats are fastidious and will avoid a dirty litter box. If you’re dealing with a litter box smell problem, then scooping after every use will solve the problem. But what if you’re not home to scoop after every use? Or you’re too busy to scoop twice a day? That’s when a self-cleaning litter box is the answer. They’re not cheap and you may need to do your research and find the one that best suits your needs, but once you find the right one it could very well be the end of your litter box smell troubles. A larger box might help you get rid of litter box smell. With more space available, your cat is more likely to avoid hitting the sides of the box, keeping it more clean. There will also be more litter to cover with, absorbing more of the odor. Think about it this way – if your cat were outside, he wouldn’t have limited himself to a 12″ by 15″ rectangle for all of his litter box needs. A larger box is more natural and better for your cat. More litter boxes provide some of the effect of a larger litter box. They allow your cat to have more space, and more clean litter. With any luck, two boxes – or one larger litter box – could help you reduce the frequency of cleaning while still keeping odor at bay. Whether yours is a large open tray, a covered litter box or a self-cleaning one – it needs to be kept absolutely clean. No part of the box should have any pee or poo stains. Ever. Keep cleaning wipes next to the box and check it whenever you scoop. See a stain? Take out a fresh wipe and clean it up immediately. Don’t let them dry up and take hold of the plastic. Clean them the very same day. If you’re using a covered litter box with a hood, take the hood off and inspect it as well as the box itself. Make sure Kitty didn’t hit the inside of the hood with any pee or poo projectiles… If they’re there, clean any residue the very same day. Not all types of litter are made the same. Some types of litter lock odor in better than others. You’d think odor control would be the first (and maybe only?) consideration when formulating litter but that’s not always the case. Ease of package, weight, environmental aspects and of course, cost, all come into play. Whatever your reason was for using your current type of litter, if you have a litter box smell problem and you can’t solve it by more frequent cleaning, it’s time to consider a different type of litter. There’s a reason why we’ve put this suggestion last. Cats are creatures of habit and some cats can stop using the box if they don’t find their favorite litter in it. Yours may be less picky – only you would know. Switching litter should never be taken lightly. 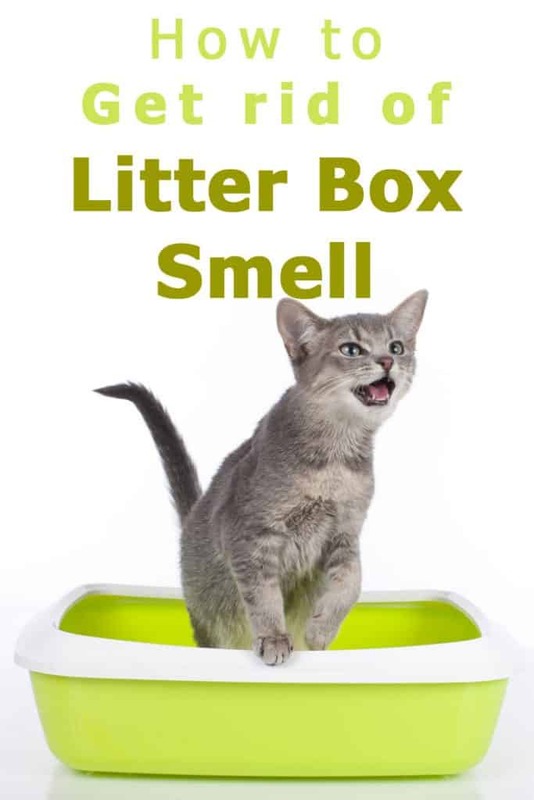 If you think this could be the answer to your litter box smell plight, then research well in advance and find the litter that promises the best possible odor control. When you switch the litter, do so gradually. Every day take out one cup of the old litter and replace it with a cup of new litter. Mix well. After a couple of weeks you should have mostly the new litter in the box. This is an ad hoc solution that may or may not work for you. Baking soda does help control odor but not as well as good quality litter. Some people use it in the litter box, as a homemade solution to litter box smell. It doesn’t hurt and may help a little but cannot substitute cleaning the litter and the box. If you search the web for solutions to litter box smell, you’ll find some pretty lousy suggestions out there. Before we wrap up this guide, we’d like to address them as well and explain why they should be avoided. How to become less sensitive to the litter box? You don’t need to adjust to any foul odors! The litter box is part of your home. It should not smell. There is no need to “get used” to it or somehow become desynthesized. A hood or cover is NOT the solution to litter your box odor problems. When you cover the box, you don’t make the odor disappear. You just set it up so that there’s more odor inside the confined space of the covered box. You may or may not get a minor reduction of smell around the box but you’ll definitely make the inside of the box much smellier. Now, you may not be sticking your own nose inside that space, but your poor cat has to enter that covered litter box and spend several minutes inside, several times a day. If it smells too bad, your cat will rightfully avoid the box and eliminate elsewhere. Don’t try to mask the bad smell by using scented litter. Scented litter is just litter with a little bit of perfume. And honestly, these scents are often as bad as the original litter smell you were trying to hide. Some may say worse. Even if the smell is ok for you, your cat may not tolerate it well. The cat’s sensitive nose will probably pick up both the original stench AND a very strong – possibly foul to the feline senses – perfume. Again, if your toilets are dirty, do you just add some perfume? Or do you clean them thoroughly first? Clean the residue of feces and urine. Treat the litter box smell head on instead of trying to mask it. There are so many air purifying systems out there. If you have an issue with other pollutants (like seasonal pollen), an air purifier may be a good idea for your home. Just don’t use it as a solution to litter box smell. That’s not what air purifying systems are for. Again, masking the stench isn’t the solution. Clean your litter box thoroughly and address any residue of urine or feces in, on and around the box. Once you do that, you won’t have any foul odor to mask and won’t need candles. As for scent dispensers and diffusers, if you want to use them in your home, that’s up to you. There is some evidence that using scent diffusers may be harmful to your health. There’s even more concern about scent diffusers and candles used near cats. Even organic natural essential oils and other scent concentrates can be highly toxic to cats. Be careful what you choose to put in the cat’s environment. At the very least keep the diffuser out of Kitty’s reach. As long as the litter in the box, the box itself and the surrounding area are clean – you will have no litter box smell issues. Use quality litter, scoop often, use a large enough box and keep the litter box itself clean. Your home will smell nice and fresh with no odor problems whatsoever.